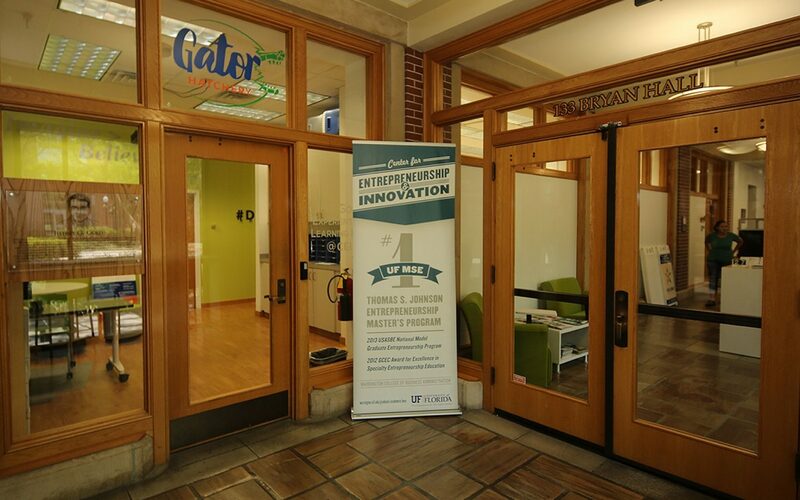 The UF Entrepreneurship and Innovation Center prioritizes entrepreneurial education for students and people of many backgrounds. The Center’s dedication to serving many groups of people in the Gainesville community and across the world has led to programs that ensure business students and leaders have access to entrepreneurial training. The Center targets a wide range of people with many programs, all aiming to have a social impact on those who need resources the most. Programs specifically assist veterans, low income entrepreneurs and disadvantaged entrepreneurs in South Africa. The Center’s growth in this area has been assisted by the Social Impact & Sustainability Initiative. This initiative provides undergraduate and graduate level courses to offer students a background in social entrepreneurship and sustainability. These classes include experiential learning opportunities and live classes. Students work with social entrepreneurs in the Gainesville community to help their venture become more financially, socially or environmentally sustainable. Students also offer assistance with business plans, fundraising, social marketing, membership campaigns and most other needs the businesses have. Since the initiative’s launch in 2005, 1,360+ Warrington students have participated in 31 social entrepreneurship-related classes, spending 25,000+ hours helping 60+ social ventures in the local community to be more innovative and sustainable. “We were one of the first major research universities to offer classes in Social Entrepreneurship,” said Kristin Joys, Ph.D., director of the UF Social Impact and Sustainability Initiative in the Entrepreneurship & Innovation Center said. “Now, 13 years later, more than 250 colleges and universities teach courses on Social Entrepreneurship, and more than 50 have centers, programs or initiatives related to Social Impact & Sustainable business because students today want to do more than just earn a degree, or learn how to start a venture—they want to learn how they can make a difference in the world. In the undergraduate class each fall, over 100 students work on a project focused on poverty, hunger, and food insecurity working with five local nonprofit organizations, including Working Food, Grow Hub, and GRACE Marketplace. Students in the graduate classes work on projects that target many different issues – lack of access to affordable healthcare, homelessness, education, the arts, environmental preservation, etc. Many students who graduate from Warrington after benefitting from the Social Impact & Sustainability Initiative go on to start their own socially responsible ventures, and they frequently return to campus to speak to students about following in their footsteps, creating and pursuing impact careers. Entrepreneurship and Empowerment in South Africa puts students on a six-week trip to South Africa to work with disadvantaged entrepreneurs in the townships around Cape Town, South Africa. Students take a hands-on approach in helping these entrepreneurs make their ventures sustainable and help South Africa’s growth. In 2018, the Center took 29 students – 15 from UF were joined by nine from the University of Colorado and five from Texas A&M. Students have worked with many different companies, including restaurants and funeral homes. The 2018 trip served 16 township entrepreneurs. The Gainesville Entrepreneurship and Adversity Program is an integrated, multi-faceted program to empower those living in adverse circumstances to create and grow their own businesses over a 12-month period. GEAP aims to empower those who are economically disadvantaged and to alleviate poverty in the Gainesville community by fostering the creation of new, profitable ventures, assisting existing small businesses owned by those with disadvantages, measuring and tracking the development and performance of entrepreneurs and their ventures, identifying and sharing best practices in poverty alleviation through entrepreneurship and celebrate the achievements of those striving to create and grow local small businesses. VEP provides a rigorous entrepreneurial learning and development opportunity for veterans with service-connected disabilities and those who have uniquely distinguished themselves in the military. The program is designed for veterans interested in starting a new venture as a means to financial independence and for veterans who have an existing business for which they would like to increase profits. It’s a free resource that spans eight months, providing veterans with self-study time, a one-week entrepreneurs boot camp on the Warrington campus, and six months of mentoring and business development support, which includes online peer-to-peer networking.